I used to hate sweet potatoes. Even with my sweet tooth you couldn’t get me anywhere near a sweet potato topped with brown sugar and pecans or even toasted mini marshmallows. The idea of something sweet on a potato just did not compute in my brain and gave me terrible mental images of pouring sugar over a red potato and eating it. Thankfully a few years ago, my taste buds changed and now I prefer sweet potatoes to regular potatoes any day of the week. 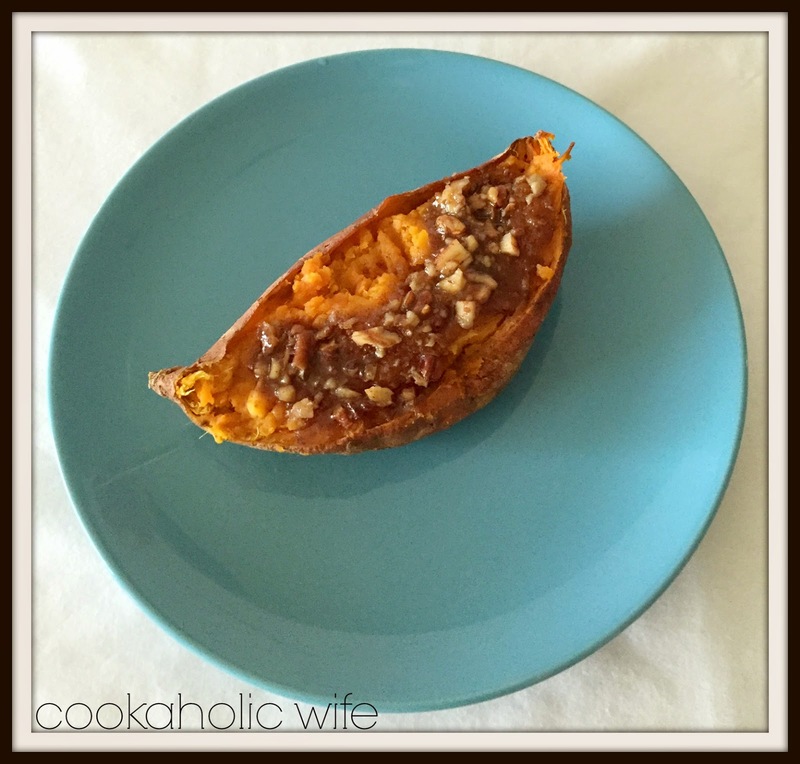 A simple baked sweet potato with butter, salt and pepper is like a meal for me, especially with how incredibly large the sweet potatoes can be! 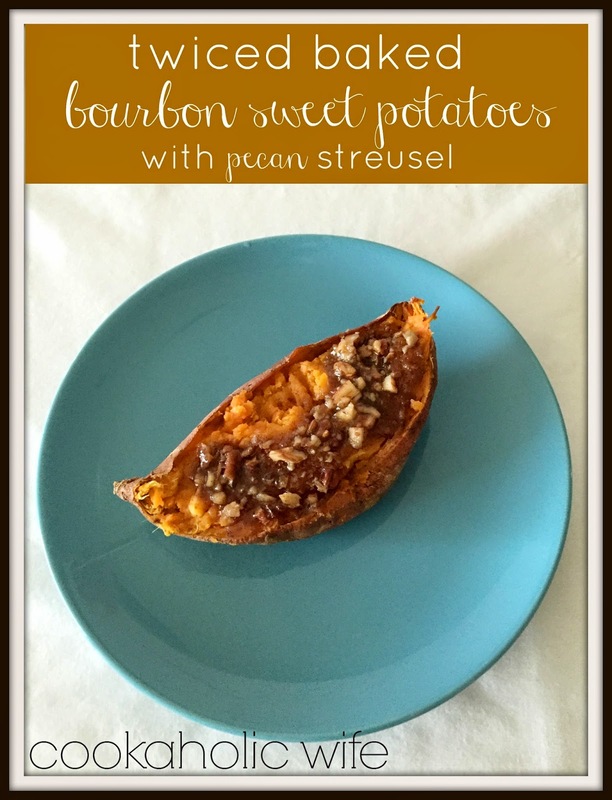 Even after beginning to like sweet potatoes I never attempted to include them in the traditional Thanksgiving menu because I still wasn’t convinced I would like them. Last year I attempted to make savory twice baked potatoes but they just fell apart and the skins burned and I gave up. This year, after seeing this recipe, I was determined to get them right. 1. Stab the sweet potatoes all over with a fork. Microwave for 12-15 minutes or until tender. Allow to cool enough to touch. 2. Meanwhile, combine butter, brown sugar, maple syrup, bourbon and cinnamon together in a large bowl. 3. Slice the potatoes in half lengthwise and scoop out the inside of the potatoes, leaving about 1/4 inch of potatoes on the bottom and sides. 4. Add the insides of the potato to the bowl with the butter mixture. Stir to combine. Spoon the mixture evenly back into the sweet potato skins. 6. In a small bowl combine the streusel ingredients and divide evenly on top of the sweet potatoes. 7. Bake for 18-20 minutes or until the topping is a light golden brown. Oh these are good. Really, really good. Unbutton your pants to shove in another bite kind of good. We had one sweet potato left over after Thanksgiving and I had it for lunch the next day. Even reheated in the microwave, this is still one tasty sweet potato combination.